People throughout Minnesota began to recognize the resource of the lake region and tourism in the early 1900s. Paynesville's business interest in tourism gradually developed as awareness of the benefits of tourism surfaced. 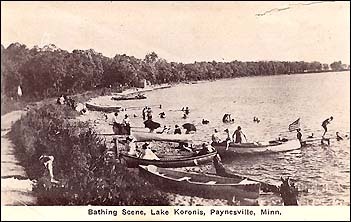 In 1912 the editor of the Paynesville Press had thoughts of resort expansion on Koronis. "Ye editor stole away from his post of toil to enjoy a picnic supper with party at Dr. Pilon's cottage, ŒRevenez-y' at Lake Koronis. After the feast the party took a launch ride on the lake, and this question came into the scribes head and is still unanswered. Can anyone answer it, "Why is not Lake Koronis better and wider known?" The way people look to lakes not as well located nor as beautiful, Lake Koronis ought to have a summer population of 2,000 people on its shores. Not 2,000 during the summer but 2,000 on its shores from the time the season opens till it closes. We believe it will not be long till there will be hotel accommodations for 500 people on the lakeshore. Some of our readers may think this is a dream but you just take a trip and look over some of the other resorts on the scale and we think that you will be with us." Local interest in tourism was matched by state interest. In the 1920s government agencies began to track incoming automobile traffic bringing tourists to Minnesota. "A tremendous increase in the number of tourists from Illinois visiting Minnesota this season has enabled that state to replace Iowa for the lead in foreign cars, reports H. C. Hotaling, executive secretary of the Minnesota Ten Thousand Lakes Association." The Minneapolis Gateway Bureau announced that 1,243 cars listed from Illinois compared with 750 from Iowa entered Minnesota in the first half of July 1927. "Šsimilar reports have been made by the cities in the northern part that Iowa is sending a smaller number of tourists to the state but that Illinois is sending more as a result of the fame of the state's vast lake regions reaching that state (Illinois.)" In April 1927, Governor Christianson announced that the week of May 1 would be designated Ten Thousand Lakes Week and that "Dr. C. P. Winther has been appointed as chairman for Paynesville." During the designated week, communities in Minnesota would cooperate with the Ten Thousand Lakes Association in "providing a national advertising and publicity fund of $50,000 which will be used to herald to the world the many advantages of this state. The amount for which Paynesville has been asked as its share in this campaign is $75.00." Arthur Roberts of Winona, president of the Ten Thousand Lakes Association, called attention to the success of the effort made in 1926 in Minnesota's development. "The expenditure of $50,000 by the Ten Thousand Lakes Association in national advertising last year was one of the best investments ever made by the citizens of this state. It not only brought us more tourists than we have ever had before, but it has started people in other states to talking about Minnesota. It has influenced magazines throughout the country to write stories concerning Minnesota and to publish pictures of our wonderful scenic attractions. It helped to attract people to not only come to Minnesota, but who will go back to their homes with good words for our state." An estimated 1,800,000 tourists spent $71,000,000 in Minnesota according to the Ten Thousand Lakes Association. "Tourists are good business stimulators. Most of them are good buyers and they have cash. Those who own summer homes here pay taxes and help us build schools and make other public improvements. They are splendid customers and I believe that we do not fully appreciate what they are worth to our state," concluded Roberts. The promotions of Minnesota's lake region in the early 1900s has led to the current tourist boom in the state. Paynesville's business community realized early the benefits of attracting tourists from near and far to Lake Koronis for a view from the lake. Information for this column was taken from the following issues of the Paynesville Press: August 1, 1912; April 21, 1927; August 11, 1927. Photo courtesy of the Paynesville Historical Society.